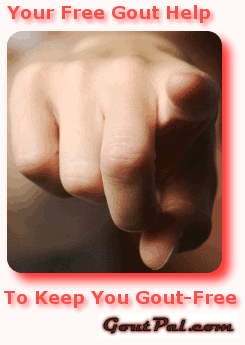 I love running my gouty arthritis websites to provide help for gout sufferers and their carers. I provide gout help freely, relying on advertising and some product commissions to pay the costs of running the website. I’m lucky that some people want to help me in return, so this page tells you how. My motivation is to help my fellow gout sufferers. You can help me do that in various ways. I’ve suggested some here. Please let me know if you think of other ways we can provide help for gout sufferers. Some gout forum contributors have complained that I hide my light too often. They get help here far beyond what they get from medical professionals, and they want to thank me in cash. I have no problem with that. I do not expect donations, but I’m always happy to receive them. Please send whatever suits you using the button on the right. Perhaps you have friends, relatives, or medical advisers who might benefit from GoutPal. If so, please encourage them to visit. If you’ve had particularly successful experiences fighting gout as a result of my advice, why not share that through letters to your local newspapers, radio, TV, etc? If you’ve learned valuable information, please take some time to provide help for gout sufferers in the gout support forum. You will see links to products and services on my websites, and if you buy your stuff through those links, I will get a small commission. This does not affect the price you pay, so I’m not asking you to spend more than you already would. I am currently reorganizing the product and service resources pages here, and you can help me do this. I already make it easy for you to buy through big trusted names like Amazon, Sears, and eBay. Where else do you like to shop? It does not always need to be about gout. In fact, it should never be that restricted, as the whole reason for fixing your gout is so that you can enjoy a better life. There are thousands of brands that want to support GoutPal by selling you great products and services. 1-800Flowers.com will help you show your love. Teavanna.com will help you relax with a delicious drink. SSENSE.com help you enjoy unique accessories. DinoDirect.com will save you money on quality electronics and gadgets. Do you know any more? If you buy anything online that you think will be interesting to other gout sufferers, please share your experience and opinions in the gout resources forum. With your help, we can build a great list of reliable products to help all sufferers treat gout. The best way you can help GoutPal is to encourage your friends and associates to spread the word. I mentioned this above, and I will expand on that here. Other gout websites are funded by rich pharmaceutical companies, or profits from tricking you into spending cash on meaningless products and useless information. They have lots of money to spend on marketing, and lots of reasons to do so. Few of these reasons are to help you find permanent ways to fix gout and enjoy life, but that is the only reason for GoutPal. Bookmark my full Internet search and use it everyday to search for anything, anywhere. Mention GoutPal whenever anyone mentions gout.